Paperback, 8 x 10 in. / 188 pgs / 170 color. Edited and with text by Barry Bergdoll, Reinhold Martin. 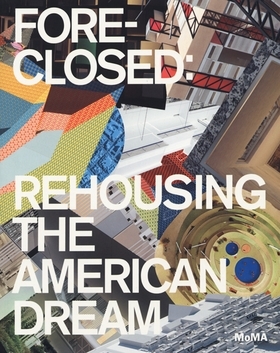 Foreclosed: Rehousing the American Dream is an exploration of new architectural possibilities for American cities and suburbs in the aftermath of the recent foreclosure crisis in the United States. During the summer of 2011, five interdisciplinary teams of architects, urban planners, ecologists, engineers and landscape designers were enlisted by The Museum of Modern Art, New York, and MoMA PS1 to envision new housing infrastructures that could catalyze urban transformation, particularly in the country’s suburbs. Drawing on ideas proposed in The Buell Hypothesis, a research publication prepared by the Temple Hoyne Buell Center for the Study of American Architecture at Columbia University, each team focused on a specific location within a “megaregion” to come up with inventive solutions for the future of housing and cities. This publication presents each of these proposals (exhibited at MoMA in Spring 2012) in detail, through photographs, drawings and renderings as well as interviews with the team leaders. With texts by Barry Bergdoll, MoMA’s Philip Johnson Chief Curator of Architecture and Design, Henry N. Cobb, a founding partner of Pei Cobb Freed & Partners and Reinhold Martin, Director of the Temple Hoyne Buell Center, Foreclosed examines the relationship between land, infrastructure and urban form, exploring potential futures for America’s extended metropolises. Featured image, reproduced from Foreclosed: Rehousing the American Dream, is "The Garden in the Machine" by Studio Gang Architects of Cicero, Illinois. 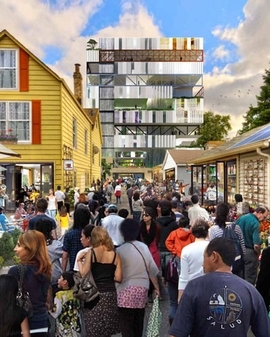 "The Studio Gang team set out to create new housing types able to mix families and generations, living and working, in ways that are generally prohibited under existing zoning codes. Using the analogy of the Rubik's Cube, the team asked themselves, 'What if the bungalow could be taken apart and sorted into separate pieces—bedroom, kitchen, lawns—and reassembled as needed?' They then designed a new kind of 'Recombinant House' enabling that flexibility. The house is affordable because people can buy only what they need at the time they need it, and then can add or subtract spaces as families grow, shrink, or otherwise change. Communal spaces can be shared among families, while work spaces will allow people to start businesses—generally informal, entrepreneurial businesses, such as bakeries, repair shops and light manufacturing. Some of this is made possible by restructuring existing bungalows, but the anchor of the new development is a 'vertical neighborhood' that shuffles and stacks homes in flexible combinations tailored to the resident's changing needs. This is achieved by redeploying the construction elements of the abandoned factory, notably its steel trusses, which are repurposed to span the distances between newly built concrete cores containing utilities, allowing for great flexibility within the building framework, and for the introduction of open spaces and gardens on multiple levels. At the scale of the urban block, the entire community is also reconfigured to allow the seamless coexistence of homes, work areas, public amenities, and a variety of green spaces. On a regional scale, these green spaces would align with the abundant rail track to form 'wildlife corridors.'" Excerpt is reproduced from the chapter "Studio Gang Architects: The Garden in the Machine," published in Foreclosed: Rehousing the American Dream. FORMAT: Pbk, 8 x 10 in. / 188 pgs / 170 color.